2010, Tyndale House Publishers, Inc.
New. 031809134351 Ships Within 24 Hours. Tracking Number available for all USA orders. Excellent Customer Service. Upto 15 Days 100% Money Back Gurantee. Try Our Fast! ! ! ! Shipping With Tracking Number. Very Good. 031809134351 Little Shelf Wear. Ships Within 24 Hours. Tracking Number available for all USA orders. Excellent Customer Service. Upto 15 Days 100% Money Back Gurantee. Try Our Fast! ! ! ! Shipping With Tracking Number. Fair. 031809134351 Missing Dust cover and Signs of wear. Ships Within 24 Hours. Tracking Number available for all USA orders. Excellent Customer Service. Upto 15 Days 100% Money Back Gurantee. Try Our Fast! ! ! ! Shipping With Tracking Number. Very Good. 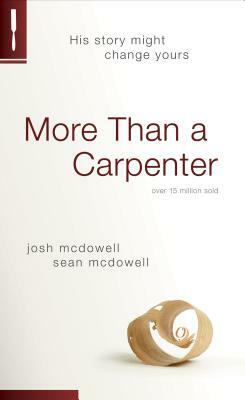 More Than a Carpenter by Mcdowell, S, 2009-06-01. Trade paperback (US). Glued binding. 179 p.
Very Good Condition. Light, reasonable wear. Clean and mark-free inside and out! SHIPS WITHIN 24 HOURS! Tracking Provided. DHL processing & USPS delivery for an average of 3-5 Day Standard & 2-3 Day Expedited! FREE INSURANCE! Fast & Personal Support! Careful Packaging. No Hassle, Full Refund Return Policy!